Along with the more traditional uses of tile in a house, from floor tiles to kitchen backsplashes, there are plenty of options for tile that may be a little more unconventional but provide incredible results. Using porcelain tile or glass tile for a variety of these unique projects can provide stunning results. You might find yourself running back to Transworld Tile for more product to keep finding new ways to use it. Here are some of the ways we suggest experimenting with tile in your home and then share the results with us on Facebook! Whether you’re looking for a unique patio table or some unique pops of color for your living room, creating mosaic side table projects out of beautiful glass or porcelain tile adds a wonderful and useful talking point to the room. In the world of DIY, this is definitely one project to try out and create something that fits your personal taste. It’s always hard to figure out how to do flooring for a stairway. Instead of choosing the standard carpet options or just hardwood, consider mixing and matching your material selection. Ceramic tile with Mexican motifs can make your staircase a center piece when combined with wood. The hardwood would be on the sections where a person steps and underneath, a beautiful selection of complimentary Mexican tiles. When you have a bar area in your kitchen, you don’t typically think about what will go on the base. People do see the base that holds the counter, so what do you do about it? Creating patterns with your choice of tile, whether stone or porcelain, will take your kitchen bar attached from drab to a beautiful entertaining space. 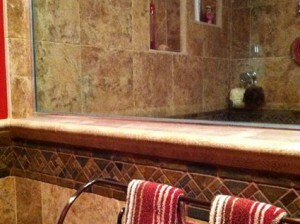 Most people choose to install granite, quartz, or acrylic counter tops in their bathroom. Instead, try something different. 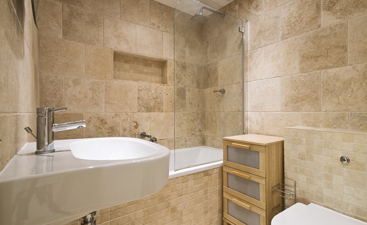 Utilizing stone tile to create unique countertops in your bathroom will set your home apart from the rest. Additionally, your counter will be able to hold up against a substantial amount of use. Natural stone tiles mixed with glass tile accents would be a perfect mix for an outdoor water feature. Can’t you imagine sitting out on your patio in the evening, watching the sunset, and listening to the calming ripples of your new decorative tile water feature? I bet you can! With the wide variety of tile available at Transworld Tile, you will be able to find the perfect mix of tiles to create an on-point water feature. If you’ve considered installing built-in shelving into your home, hold that thought. If you want to spice up your built-in shelving, consider applying sparkling glass tile squares to the back of the book case. The reflective nature will help increase the light in the room and provide something unique to an otherwise standard built-in bookcase. 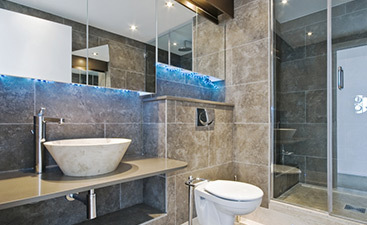 For all your standard and unique tiling needs, contact Transworld Tile or stop by our showroom. 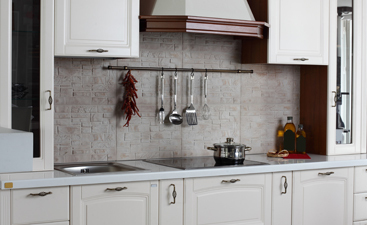 We’d be happy to discuss your project with you and help you find the perfect tile!